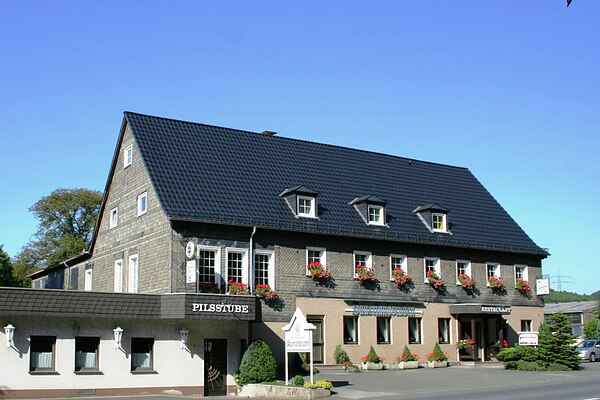 Enjoy lovely days in the pristine nature of the popular Sauerland holiday region. This large accommodation consists of two separate holiday apartments connected via a corridor. The apartments are on the top floor and you will have this whole level entirely to yourself. An ideal accommodation for enjoying a holiday with friends or family while having the privacy of your own area. In the building there is also a restaurant with a cosy beer stube and bowling alley. Enjoy the in house beer garden in the summer with cake, coffee, ice cream or large or small dishes with cool drinks. The endless meadows and forests of the village and the region will lure you out for lovely walks, hikes or cycling tours. When the weather is poor, you can also visit the indoor swimming pool with sauna and solarium nearby. Not far away you will find Meschede with its lovely shops and cafes, the Benedictine monastery and the city hall with cultural offerings. Other exciting experiences are the nearby visitor's mine in Ramsbeck, Castle Laer, the Warsteiner Brewery or the popular Fort Fun leisure park, or Panorama Park, and the famous Karl May Festival in Elspe. Winter sports enthusiasts rejoice! The popular ski areas of the Sauerland are also right on the doorstep.